When we first starting putting Mosaic together, I was all excited to exercise my basic scrounging skills and start accumulating stuff to fill out all our new spaces. Alas, Mosaic took a LOT longer than expected to come to fruition, but now we can finally start getting all the bits we’ll need. Since we have a great room that can seat 60 or so folks for meals, we needed a lot of chairs. 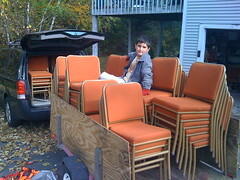 Through the magic of the Harvard Recycling Program, yesterday morning we picked up 84 very sturdy ex-restaurant (or hotel, we’re not sure) chairs. They’re in great shape, if a bit orange, and very sturdy. chairs I have found online.